Meet our new favourite side dish. 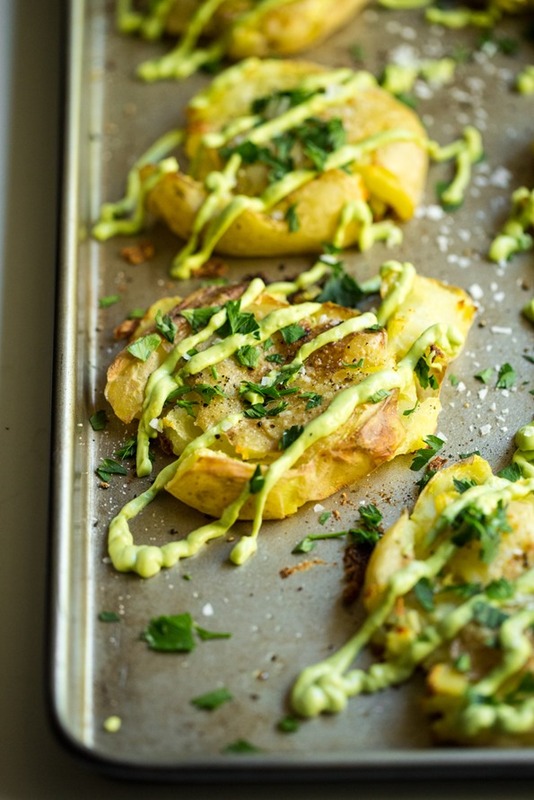 Yukon Gold potatoes are boiled, smashed, roasted until crispy, and then topped with a decadent, yet heart-healthy, avocado garlic aioli. Be still my heart. In the spirit of new beginnings for our little family of three, I decided to add something new to my Thanksgiving repertoire this year. Eric and I polished off the first batch all on our own…no regrets! hah. Well, my only regret was that I didn’t make a bigger batch. One of my all-time favourite ways to enjoy Yukon Gold potatoes! Smashed, crispy, and served with an addictive—yet healthy—avocado garlic aioli sauce. These smashed potatoes make a killer side dish. I recommend looking for potatoes on the smaller side if you can, as they "smash" a bit easier, but larger potatoes will turn out fine too. Smashed potatoes inspired by Leaf. Place the potatoes on a large, lightly greased baking sheet. (Skip the parchment paper for this recipe, as an oiled baking sheet with produce crispier potatoes.) With the base of a mug or metal measuring cup, "smash" (press down on) each potato until each one is mostly flattened. Some potatoes might break apart a little, but this is totally fine! Nutritional info uses 1/2 teaspoon fine sea salt. If you have any leftover potatoes, they can be reheated in an oven on a greased baking sheet at 400°F for 6 to 12 minutes, until warmed throughout. The Avocado Garlic Aioli doesn't heat well (it tends to brown), so I don't recommend heating it, but serving fresh whenever possible. This looks delicious! I’ll be adding it to my Christmas menu, for sure! I really think they would satisfy my non-vegan family. And I think it’s a sign that I have all of the ingredients in my kitchen right now. My husband and I might get an appetizer before dinner tonight! Stupendous. Marvelous. Making these like you said, as soon as humanly possible. Love yukon golds as well! But the avocado garlic aioli, so eager to try. Don’t love avocado’s so I’m trying sneaking ways to incorporate them into my diet with foods that I love (like potatoes!!) Can only imagine peoples faces lighting up like the 4th of July when I bring these to Thanksgiving Dinner!! Oh my goodness, these look delicious. They seem like they’d be fairly easy too! Wow, these look amazing Angela! I love potatoes and when I feel lazy I’ll even have just a big bowl of mashed potatoes for dinner! (I do add some carrots and/or squash to the mix to fake having diversity in my meal :p). 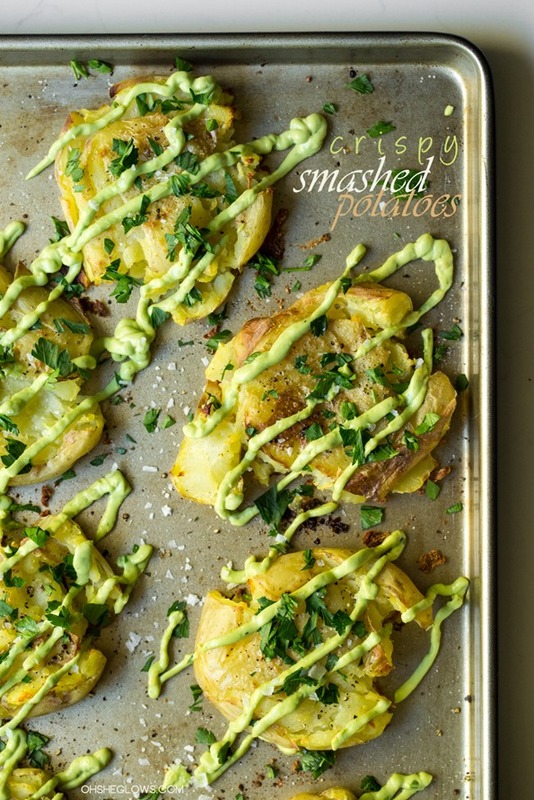 I will definitely try these smashed potatoes, they must be so crispy and the aioli must give a great burst of flavor! It looks like I will have to make this one time! I really like both the Ideas of the smashed potatoes and the avocado aioli. Very interesting! Emily I was about to post the same comment!! Interesting combo, but looks delicious. Can’t wait to make this! That aioli makes these go from super yummy looking to straight up amaaaaaazing! Love! Yum, can’t wait to make these ASAP. I can’t tell, are the potatoes peeled or with skin? Thought that might be the case.. I’m sure the skin adds extra crisp (yes, please!) :) Thanks, I love your recipes! Want these in my mouth RIGHT NOW. Thoughts on substituting mayo product for Greek yogurt? Hey Jen, if you like the taste of an unsweetened yogurt Im sure it would be just fine. I would add a bit at a time and keep tasting it rather than add the entire amount all at once. Hope this helps! Oh, YUM! Angela, this looks absolutely amazing. I just love your recipes and I cannot wait to try this one! My favourite things all *smashed* together! YES! I’m drooling over here! I am on the search for vegan recipes to bring to a very non-vegan thanksgiving so I can have something to eat ;). These will DEFINITELY be made! I try to stay away from any kind of mayo, including Veganase. Can I sub for a nondairy, plain yogurt? I would imagine you could make that swap – let me know if you try it out! I would add a bit at a time and keep tasting it just to be sure. what about soft silken tofu? I have a recipe for a “mayo” made from tofu, so I bet it would work. I made a variation of these the other night but they were missing something…i think you’ve just introduced me to that something! I make potatoes like this all of the time and they are so good! I usually microwave them before smashing but I wonder if boiling would be better for retaining nutritional value? Either way, I’ve never thought to add toppings other than oil & herbs though so I love the idea of the avocado aioli. I’m not sure I could be trusted to share them! A naturopath recently told me that microwaving a vegetable essentially changes it’s nutritional value to that of a rubber shoe, lol. She said boiling is much, much better (we were actually talking about making baby food at the time). I know this comment is a year old now but I just had to comment on this myth. I think because the idea of radiation from a microwave seems so foreign (still) it falls victim to completely unsubstantiated rumors that it is somehow worse nutritionally for food than other means of cooking. I would rather microwave my food than boil it (strictly speaking in the nutritional sense) as boiling leeches nutrients from the food into the water. This is a very well known fact of boiling and is why steaming is recommended over boiling. Also, the longer a food is cooked, the more nutrients are lost. Lightly steaming is best (of course, not possible with this recipe) but microwaving isn’t some horrible thing, at least not that any evidence has backed. It will destroy nutrients, of course, but so does baking (I am not advocating raw eating here either as many foods eaten raw are actually healthier lightly cooked and some even have mild toxins that are destroyed upon cooking). So, to wrap up a long-winded comment…Microwaving if the potato is in water is just as bad as boiling. I would, however, not ever say that boiling is better than microwaving. That being said, potatoes aren’t so nutrient-rich that I would be too concerned. :) This recipe sounds like it would be fabulous regardless of how the potatoes are cooked! These sound amazing! What a perfect side dish! I am kind of carb-ed out after chicago, but as soon as I start running again I am sure I will want them back in my life. These would be SO good!! YUM! Thanks for coming up with yet another delicious recipe! Although I know you do not eat eggs, I could see a fried egg being a nice addition as well. Can’t wait to make these! Hi! This looks wonderful!!! Do you think the recipe would be as delicious with sweet potatoes?! Thanks! That’s a great question – I haven’t tried it with sweet potatoes but what a great idea! Let me know if you try it out. I was thinking the exact same thing! Would love to try it with sweet potatoes and can imagine the avocado garlic aioli would also be a nice topping! I made this tonight (normal potatoes for the family and sweet potatoes for me) and I used the same method as above and oh my…this was delicious!! This recipe looks SO delicious!!! I’ve never thought to put a sauce on my smashed potatoes! I’ll have to make this recipe soon! Ange, these look unreal!! It’s like being able to have your mashed potatoes and roasted ones at the same freaking time and I LOVE IT!! That garlic aioli…. girl, you have my heart! This looks soooo good! What a great invention….Just my taste! Want to try that as soon as possible!!!!! Angela, these look fantastic! 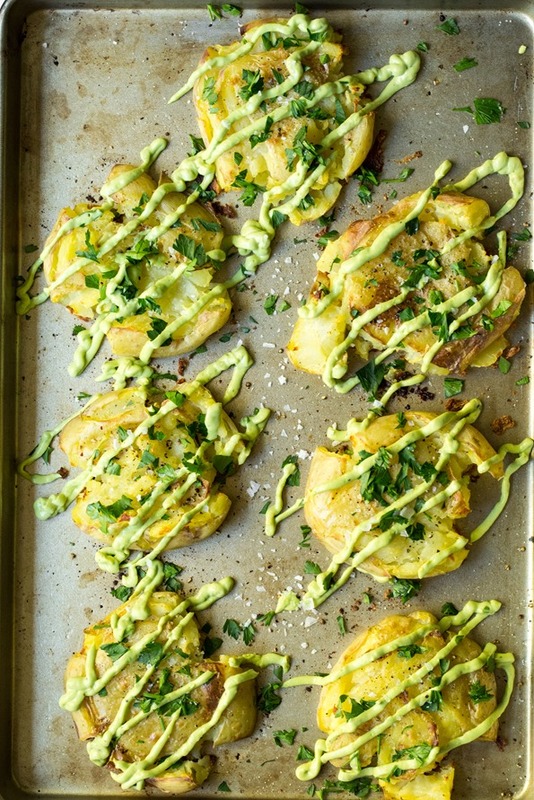 Love potatoes in just about any form or fashion, but these look especially great with the avocado garlic aioli. Can’t wait to try these! Pinned. Oh. My. God. This looks so good! Yukon gold are my fave potatoes- I usually just bake them but this looks 10x better!! I NEED THESE IN MY LIFE!! Looks delightful, upscale, and yummy. I love smashed potatoes like this! Soft and crispy all at the same time. Gonna have to try out that aoli. Hope you had a great Thanksgiving. What else did you serve?? These look smashing! Ha sorry I couldn’t resist the opportunity for an awful pun :) But in all honesty, they look fantastic and so easy! I’m making them tomorrow! This looks amazing! Is there any way to make the aioli without the mayo though? I’ve never liked it, but I want the sauce when I make these! So great, love the flavors. And those pics are awesome! I love eating potatoes cooked this way! And this aioli sounds so good! Sounds like a great recipe! I make something similar only I nuke the potatoes first. The rest is the same. I sometimes use different toppings, and have to try this one this weekend! Looks so good. Saw this and instantly made it for dinner. Fantastic!!!!! As I’m not a mayo person (with or without eggs doesn’t matter) I used some guacamole with extra lemon juice instead. Wonderful. Thank you. Hoping to make these for dinner this weekend! They look delicious. What did you eat them with? Any suggestions to complete the meal? This is such a clever idea! I love the idea of adding the sauce too. They look incredible…*trying to resist urge to get out of bed and see if I have the ingredients to make this tomorrow*. I made these tonight and they were great! Thank you for another great recipe! Thank you for being so fabulous! You never fail to disappoint! I have the potatoes in the oven now and the aioli is ready! The aioli is delicious, I can think of many uses for it! Thanks for another great recipe. These are completely gorgeous! I love smashed potatoes and paired with an aioli? That’s so smart! I just finished eating this for dinner, it was great! I halved the aioli and still have some left over, do you think it will keep overnight? or will the avocado in it make it go bad? This looks amazing! Any pairing ideas? Yum!! I think we’ll be trying these this week! I am DYING looking at this recipe. Can’t wait to give it a try! I had the same problem trying to “smash” the potatoes– must not have let them boil long enough, even though they were fork tender. I’ve been making potatoes similar to this for a while (called Crash Hot Potatoes), but without the aioli. I’ll have to try that next time! Oh my goodness, my mom is going to go CRAZY for these! Potatoes and avocados are her all time top 2 foods. Thanks for sharing, Angela, I might even make these as a side for (American) Thanksgiving! That avocado aioli is a great idea! I’m always looking for vegan sauces to dip my baked sweet potato fries in. Thanks! Made these last night with honey mustard chicken breast! They were absolutely delicious! As soon as they were gone I wished I had made more. Thanks for the recipe, love finding new ways to eat potatoes! This recipe is so easy and so delicious. We tried it last night and my husband and I love it. I replaced soy-free Veganaise with almond milk and a little bit of a coconut butter and the taste was amazing. I saved 2-3 Tbsp aioli for my red cabbage and carrots salad that I have for lunch today. The combination is really good. I just made these and they are amazing! Mine didn’t come out as pretty as yours, but they are really tasty and definitely my next potluck dish. Angela, I made these last night and they were a huge hit with my entire family (which includes 2 teens and a preteen). So simple and so delicious! I have followed your blog for a while and, once hooked, I pre-ordered your book, which is excellent. Some things that have quickly become favorites in our house are your 10-spice vegetable soup with cashew cream and your chocolate chip cookie dough bars, which I modified slightly by adding some oats (from another comment I read). My kids insist that I keep a constant stock of the bars in the freezer! I also love your great ideas for bowls of all sorts. I really appreciate what you do and wish you the best! You have one lucky baby!! This would probably look (and taste) amazing with purple potatoes. these are freaking amazing. the only way i will ever eat potatoes…ever again! i didn’t have any vegenaise but i subbed a little cashew cream and it worked great. thank you! Great sub! SO glad you enjoyed it. We can’t stop making it! hah. I tried it today and loved it. Easy and delicious. My roommate liked it too. Thinking about making these for a potluck. Any ideas on how cutting the boiled potato in half before crushing would work to make more servings? These look amazing! The avocado aioli is such a great idea. I think it would go great on a lot of foods. These would definitely be a crowd pleaser and no one would guess that they are healthy! Can’t wait to try. Just made these. DELICIOUS. I will definitely be making these again! I made these tonight as a side for tofu scramble, and OH MY were they delicious! My hubby and I both loved them!! I can see how you polished off the first batch, miraculously we managed to save some to take for lunch tomorrow! We already can’t wait to make them again! I eat more potatoes than I would like to admit and am always looking for more delicious excuses to cook them! I love these smashed potatoes and that avocado aioli looks so delicious :) Avocados and potatoes are a great match! Oh my gosh, these look amazing! Crispy potatoes are the best and I love aioli! Can’t wait to make them!! I made this Angela…. DELICIOUS!!! Awesome Friday night dinner. Hubby enjoyed it too. grilled it at the end and used garlic and herb salt on the potato. These were delicious. And easy! I notice that lots of folks leave messages about how amazing the recipes sound or look. Let me tell you, I made these last night for my family of transitioning meat eating men with stuffed mushrooms and kale ceasar salad, and was told it was my best vegetarian meal yet! Better than french fries, mashed potatoes, and baked potatoes. We have three boys (4 yrs, 8 yrs, 12 yrs), who are self proclaimed chefs, who said they could have these with breakfast or lunch or dinner. Thanks so much. You are making this lifestyle change exciting and enjoyable for our whole family. Your comment was a pleasure to read and I’m so happy that you and your family love this recipe. Good call on serving this with stuffed mushrooms and kale salad, I’ll have to try that. Made these last night and they were delicious. Next time, I would smash the potatoes more than we did so that more of the potato got crispy as it baked. Very good! I made these yesterday!!! So So good! The changes I made: Used a mix of small red, yellow and purple potatoes. And in the avocado sauce, used Greek yogurt instead of mayo since I didnt have it on hand. It turned out absolutely delish! I also added a bunch of cilantro to the sauce while blending it. It reminded me of the potato-asparagus salad from your book. One of my favorites. I may go home and make this immediately! Hello, I made these last night and they were awesome!! Even the toddler liked them. I love when recipes are simple to make and quick to put together! Great comfort food for potato lovers. I used the homemade mayo that I had on hand (from Angela’s cookbook recipe). My fam is not big into potatoes (like I am) but they loved this. Beware, you are going to have the linger of yummy garlic after. I’ve made these potatoes before, but I must try with the aioli. Looks so good! I struggled with deciding on a good main dish to serve it with, though. Ultimately, I decided that I wanted to roast some eggplant and zucchini in olive oil, then add them to a thick, garlicky marinara. I made a few brown rice noodles and served my boyfriend my take on spaghetti. The plate looked adorable with the pasta drowning in the thick, veggie-filled sauce, and the smashed red potato sitting innocently next to the whole mess. The combination of the salty, crispy potato with the soft, flavorful vegetables and the powerful sauce was killer. Thank you, Angela, for yet another wonderful meal. Looks a good yummy recipe but, healthy though…eager to try out. It’s not even 9:00 am and I’m getting up to make these now. Thank you!!! Thank you for the warning! That sounds like something I would have totally done too. just made with cashew cream in place of veganaise, delicious! Love them! Hi Angela, we just tried those last night and they were absolutely amazing! Thank you for your good work and you are an inspiration. I used olive oil with a touch of dijon mustard in place of the mayo and ilime instead of lemon and it made a beautiful and tasty drizzle. We made these tonight – they were wonderful! Our potatoes were medium-sized and could have used more boiling time (more like 25-30 min). They were really difficult to smash (I used a potato masher). We corralled them into decent looking piles, but once baked, they came out perfect! Our 14-month old inhaled 2 of these! We are currently making them and very excited to eat them! When we went to “smash” them, they didn’t hold together. We’d love to make these again, thoughts on why that may have happened? Cooked too long? Not long enough? Hi Maya, Yes this is normal for them to fall apart a bit – not to worry! These look so amazing! I can’t wait to try them out this week! This is the perfect recipe for the upcoming holidays! Thanks for sharing! I can’t wait to try it! Just made these for my boyfriend and myself. So freaking easy, and my taste-buds still love me even hours later!!! So so so so sooooooo yummy!!!!! I’ve only recently made squashed potatoes and I love them, love those crispy bits. The aioli looks divine and perfectly matched! I made these on Saturday and they are wonderful! Thanks for the recipe. When I saw these I wanted to make them straight away! I made them tonight for my omni family and everyone loved them – they’ll be made again! These look so good!! I am living in Spain for the year and trying to find new things to cook with the different foods available, and let me tell you they have potatoes here! I just bought a food processor, lived 2 months without it and it was tough since I am a gluten and corn free vegan…need it! I also was just suggested your cooking book on Amazon.es! Made me happy, thought it might make you happy too! I love your recipes, they inspire me when I am feeling frustrated. Thanks…these potatoes are so happening. I Just find your Blog Angela. It’s amazing! I’m your fan now. The recipe looks soooo yummy especially for the Avocado Garlic Alioli. Definitely I’ll try it! Congrats on your little baby!!! I am so happy for you! I’ve been reading your blog since 2009, and I’m so glad to have been a little part of your journey as a faithful reader. Did you see that your blog is mentioned in one of the first few pages of this month’s Glamour?? One of those famous models (Karlie Kloss, maybe?) mentions your blog as one of her favourites. Made these last night…they were AWESOME and will be going into our regular dinner idea rotation!! YUM! An amazing side dish. Family totally loved it. Thanks. I made these last night for my family and they were amazing! Even my 12 year old son who is a picky eater ate everything, including the avocado aioli. Thank you for sharing all of your wonderful, inspiring recipes. These were amazing! My boyfriend got all creative and added additional “toppings” to some of the potatoes before rosting, like capers, vegan cheese shreds… I think we will have fun trying these with different toppings depending on what we’re serving them with, although they were perfect on their own already! Thank you! Oh and congratulations on your little baby girl! I used Red Viking Potatoes. Beautiful and Amazing! This recipe is a new family favorite! I love your website. :o) Thanks for all of the great ideas! 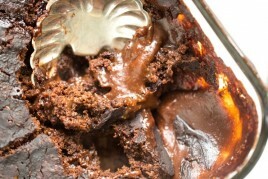 The gluten free gooey pumpkin chocolate cake is in the oven as I type….can’t wait! Just thought I would add .. for so many people who think this recipe looks good but haven’t given it a try yet … I am passing on “Awesome” from my daughter and from a friend who both tried it. Great website, now one our favourites. Well I hope you’re happy! Because of this recipe I will never be able to eat potatoes any other way! These morsels of crunchy, fluffy and utterly delectable flavor was superb. I can take or leave potatoes, but these bundles I’ll never be able to resist … never. Hi I’ve just made it, super yummy. I didn’t add salt to the roasted potato and less for the sauce. I might use less vegan mayonnaise next time. But overall smashing ( no pun intended ) recipe. I use a low GI potato Carisma and had it with steamed sweetcorn and a salad. Hit the spot. It’s spring here in Australia and this recipe is a winner. I can do it on a BBQ and do it with vegetable kebabs I think. This recipe was AMAZING! My 4 year old completely smashed it! I didn’t give her the aioli because she doesn’t like garlic but before the meal she said she didn’t want it and after I convinced her to eat it she ate the whole thing and asked me to make it again! Mum and hubby loved it too, served it up with rocket, cos, red capsicum and coriander from the garden with avocado oil dressing on the salad. Delicious!! I am embarrassed to ask this but here goes: When you say ‘roast’, do you mean ‘bake’? My oven has bake & broil……and I have never roasted anything unless, it’s another word for baked. Excuse my ignorance & yes, you can all giggle. Awesome recipe, as usual, Angela. I have a comment regarding your website, actually. I use my iPhone to follow recipes from your blog. When I click the little bars in the upper left corner so the page is easier to read, the ingredient list always goes away! I can see the ingredient list on the normal page view though, but since it’s on my phone, it’s always so hard to read. This used to happen on my 4s and it s stl happening on my iPhone 6. Weird, anyway, I love your recipes and will keep making them even though the phone makes it a challenge! Made these tonight with pan seared sea scallops and roasted Brussels sprouts. I used smallish red potatoes and they turned out fabulous! Just a perfect side dish! Absolutely yummy! Whoa. I must make these. Soon. Thanks for the brilliant idea! Making these tonight – yum! Suggest you adjust the recipe cook time – the potatoes from start to finish are more like 50-60 minutes (20 min boiling + 10 min cooling + 25 min in the oven). Thanks for a great recipe! Glad you like the recipe! Thank you for noticing that, it has been adjusted. I made these for dinner tonight, and they were amazing! My husband, my 4-year-old, and I all had seconds – we loved them! I did not have a ripe avocado so I substituted guacamole. I think that gave them a bit more zing than the original… so I tried to calm it down a bit with some olive oil. If you have been thinking about making these, and haven’t yet, DO IT! I love how simple this recipe is yet the result is a gourmet side dish. I was surprised how delicious the aioli turned out. I made it with a regular mayo and I did find it a bit too thick ( husband didn’t) next time I might add a bit of olive oil. Loved this! Made for dinner tonight, used sweet potatoes instead and still turned out great! the Bf couldn’t get enough of the sauce! Wonderful tea adventure ….hope you add a second cookbook!!! And congrats on beautiful baby girl!!! Made the potatoes last night, & they were a hit w/ the whole fam! Yum!! My husband and I have made these twice now. We devour them within minutes after they come out of the oven! I made this recipe last night and it was fabulous! Well done. I use your cookbook all the time and usually have it out on my island since I use it so much. Hi made these yesterday and they were amazingly delicious! didn’t have Yukons but baby reds straight from farm and they worked very well. thanks for the recipe this will be on my christmas menu this year! Truly delicious! We love your recipes. Can’t wait to try your teas, as well as purchase your cookbook! Holy moly! This is a must try! Made these last night for a dinner with my mom and niece. My mother told me they were the most delicious food she had ever eaten and took my print out of the recipe :) They are so easy and really are amazing, thanks for this recipe everything was perfect! these are an especially good idea for a california thanksgiving. and for my potato-loving british husband. thanks always for the inspiration! Cannot wait to get out of class to make this! YUM!!! Yum! I made these last night to go with a dinner salad and was very happy with the result! So easy but something I never would have thought of on my own. I haven’t found any vegan mayo I like so I just put in a bit of olive oil with the avo along with the rest of the ingredients and the aioli turned out great! Thanks so much for the recipe! I have never been able to make a great side of potatoes to add to dinner and this recipe just killed it! Super easy and they are absolutely delicious! They don’t last nearly long enough! Thank you!!!! I made this and it was absolutely delicious…the combo of the crispy portions of the potato and the smooth avocado creation was excellent. I will definitely make it again. I didn’t have parsley so served it with cilantro which worked very well. Oh my goodness, this looks like potato heaven! I cooked these tonight and even my sauce hating teen LOVED them! I’m already craving more! The whole fam devoured them! What do you do with the leftover sauce? I have a lot leftover and I don’t want to through it out so what do you do with the leftovers? Besides cooking more potatoes?! This recipe was not only super simple to make, it was also delicious! This aioli is sooo yummy and SO easy to make!! I will definitely be using this on everything! Yes, i did them asap and it was delicious. Told my kids they were “special fries”, they loved it too! What temperature do you use to roast the potatoes? Made these tonight and we were in heaven. Wonderful! Next potluck I go to I will bring these at room temperature instead of potato salad. Thank you for this! I usually only make your desserts but im going to try out some savory stuff now too! So excited! I am making these for a neighborhood wine tasting party. The theme is German wines so I thought this would go perfectly. I will let you know how it went. I made these last night and they’re delicious! I’ll be making them more and more now that I know how easy they are to make! Yep! Made ’em. They’re really great. I just made the avocado garlic aioli and drizzled it over a veggie pizza (without cheese). It was delicious. Can’t wait to try it on the potatoes. Do you think it would work to use baby potatoes and make this into an appetizer? My aioli wasn’t the smoothest but omg my new favorite way to make potatoes! Yummy! Had these for dinner and used very ripe bananas with some olive oil instead of veganmayo (for those on a more natural route/don’t like them). It came out AMAZING. 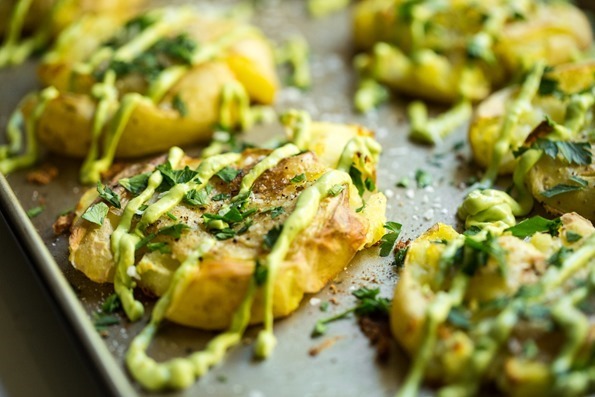 I had some dinner guests over tonight and make these… Even my 8 year old LOVED the avocado-aioli. Yum yum yum. I tried it and this is a great recipe! Crispy potatoes with creamy avocado. This is the ultimate in deliciousness! Yum. These were delicious and turned out just like your photos which always makes you feel so accomplished! The avocado aioli sauce is just out of this world. This recipe looks amazing. I plan on making it as an appetizer for a Thanksgiving potluck but not sure on how to maintain the potatoes’ crispiness during transit (45 mins or so). Any suggestions? I would use the oven at the house I’d be going to, but I’m afraid it might be occupied by a roasting turkey. I dont think they will stay crisp in transit unfortunately. I think a good reheat for at least 10-15 mins in the oven might help though. Oh I see. Can the aioli be stored without being affected by the avocado? I made these last night and they were everything they promised to be. The texture combination of the crispy potato and the creamy aioli were sent from heaven, and the flavours were spot on, perfectly balanced. Everything was perfect. 5 stars Angela!! If you haven’t tried it already, get onto it ASAP! I just made these for my husband and I as an appetizer but they ended up becoming the main course because they were so delicious we ate all of them! These are awesome! This is a beautiful recipe. The potatoes were crispy and a bit salty however I’d leave those potatoes in the dirt if I had to choose between them and the garlic aioli. Luckily, I am not forced to choose. Brava Angela! Oh my heavens~!!!! These were delicious. I ate two. This is definitely a must make and I can see where I will be making them more and more in the future. This was my first time making aioli – so simple – thank you for this recipe! Thank you for this fun-to-eat dish! I used small potatoes and they were perfect for a wholesome snack! 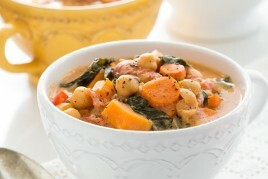 My daughter Adrienne is vegan, so we have tried many amazing meatless dishes this year! We included these potatoes in our first vegan Thanksgiving dinner along with your lentil loaf & cranberry-pear sauce. Loved loved loved them all! Happy holidays to you and your family! Wow made these last night, big hit! Thanks. I made these last night (gave you credit on instagram). As I said there, they were SOOOOO good, that I got up half way through eating them to start a second batch (knowing they take about an hour). DELICIOUS!! OH MY GOSH! Is this woman a good cook or WHAT?! This is by far one of the best recipes I have tried in a while. Who knew vegan could taste this good?! My husband and I gobbled them down at warp speed and I will definitely make them again and again. Alot of women commenteing here! Thought i would even things out a bit, this is tasty! I tried these and my God they are out of this world! So simple, but so tasty. At my local Goodness, Me! they were out of regular veganaise, so I grabbed the chipotle version and it was so darn good! Keep doing what you’re doing, because it’s fantastic. Whenever I’m in a food rut I just pop buy here and I get excited to try everything you post. I finally got around to making these last night and they were DELICIOUS! I used yukon gold, red and purple potatoes. My aioli was quite thick but I will definitely be making them again! These look amazing! I can’t wait to make them for Christmas dinner! …i know it says serve immediately…is there any way of making them the night before and still having them be just as good/presentable the next day?? that…. aioli… oh my god. Wow! Thanks for another great recipe Angela! I made these for Christmas dinner and they were a hit. These were very easy to make and the flavor was amazing. I made these last night for a vegan, gluten free Christmas dinner. You were right they flew off the plate. Good thing I have still have more yukon gold’s to make it again tonight! My husband hates “anything” healthy and loved them!! My vegan guests were very impressed and they were so easy to make! Love your recipes. I also make your lentil walnut loaf and best kale salad. Very delicious! Thanks! My family devoured these for our Christmas dinner today! Soooooo delicious! Thank you! They will be a staple now on in my kitchen! Any suggestions for what to serve with this recipe to make it a dinner? I made these for the holidays for my family and they loved it! Awesome recipe! Husband and I made these tonight (we had to, they looked AMAZING!) They were absolutely amazing and delicious and wonderful and perfect! I am so stuffed right now, but completely ok with it as they were totally worth it. These will be a mainstay in our menus from now on! My boyfriend and I just made these for dinner and I quote “whoa. We are making these potatoes every night for dinner”. So good! Another amazing dish! I’ve made this dish at least 5 or 6 times since Thanksgiving! Yum! Haha, this will make you laugh!! I made this for my family and in my sleepy, Christmas-Day-Haze, read “one or two cloves of garlic” as “one or two bulbs of garlic”. I put 10 cloves in instead of one, but it still got completely eaten and admired! I’m going to make it again with the *right* amount of garlic, thanks so much for the recipe!! LOL!! So funny, glad it was still enjoyed! I’m trying desperately to get a photo of this recipe into my recipe app/meal planner and I can’t drag it over. I use Pepperplate (it’s on the web and is also an app) and I like to put the photo with the recipe. Any suggestions? Thanks! These look delicious and I can’t wait to make them. OMG. I just made this amazing version of potatoes and I need to say this the best I ever taste in my life! It was yummy and super filling! I made a red cabbage salad with it and it was just perfect! I am pretty sure it’s gonna be a regular dish at home! Excellent! The texture of the potatoes was out of this world. Everyone else loved the aioli. It was great but a little too mayonaise-y for me. Yes, I realize aioli is a mayo condiment but I don’t like mayo. The taste is weird to me. Any suggestions for a mayo sub? I saw someone suggest banana above but am wondering if there’s something else I could use that would not effect the flavor profile? Would a splash of non-dairy milk thin it too much? I did try them but the result wasent as good as i thought it would be. The potatoes dident hava that crispy feeling i was looking for. And they turned out very dry. The Aioli wasent tasty either. Not my thing. These are sooooooo good! My husband has asked for them to be part of his birthday menu! Thanks once again for an amazing dish! Did you use a squeezy bottle to put the aioli on the potatoes in the pictures? Is the consistency pretty thick? I am going to make these to bring to a dinner tonight, trying to figure out how to serve with the aioli. Chew and I made these for the Christmas party we hosted this past December and they were devoured! We made tons of the avocado aioli and ate it with crackers like guacamole; it was delicious like that too! I loved the smashed potatoes so much I made them again for Christmas morning breakfast and my parents were sad to hear I didn’t make extra. Thanks for the fantastic recipe, I don’t think I’ll be eating my potatoes any other way now. I included a link to this recipe in my Christmas newsletter. Yea, this recipe is that good. Thanks for sharing this so I could share it with more! I hope this (late) message reaches you. Even if I read your posts often, I missed this one. Please leave the peels of the potatoes away!!! They are poison! Scientists found out. I’ll try to find information on Internet and will send to you, but I fear they are in German. – All the best, Gabriele. “Solanin” (German) is part of the peels. I mixed the leftover aioli with chunky mashed chickpeas & ate on toast. So good! Next time I will try to go lighter on the mayo and heavier on the avocado. I have been wanting to try these for a while and finally made them last night. I used butter potatoes. They were a huge hit! Easy to make (although obviously takes time) but the presentation is fancy. Reheated well and made for a great lunch today! Will definitely make again. Hey! Thanks for this recipe! I am new to blogging, new to the vegan life, and new to cooking too! So fun short recipes like this make me happy :) And, looking at the ingredients list, I have everything but the avocado and the soy free vegan mayo. Is there a reason it should be soy free? Looking forward to trying these! So crispy and delicious! I didn’t have vegan mayonnaise so I used a little bit of almond milk instead, but it didn’t make too much of a difference as far as I could tell. Even my mom, who NEVER likes my vegan recipes, had two potatoes! Thanks for another awesome recipe! These are delicious. Very easy and loved by adults and children in my house. Thanks! These are Incredible!!!! The only thing I would have do differently next time is make more. I wound up making more that same night so that we could take leftovers for lunch. They were super crispy & when topped with the avocado aoli they were mind blowing. One does not need to be vegan to appreciate these-they will be a hit with just about everyone (which is why i had to immediately make more). I think this is my new favorite side dish. I wish I could paste an extra star in the reviews to give it 6 out of 5 stars. Made this recipe for my 3rd week of the Whole 30. Since soy is out during the Whole 30, I subbed the vegan mayo for softened canned organic pure coconut milk, and added it 1tbsp and a time until I got the right flavor and consistency. Absolutely loved it! Definitely adding this recipe to my list of all-time favorites! I just made this. Yummo! Yes, they will enter regular rotation. Thank you! These look amazing! I am making them now to go with a pumpkin sage butternut squash soup. Can’t wait to see how everything turns out!! Woohoo! ** update- I made these and they are OUTSTANDING!!! Do you know if (or think) these freeze well? Minus the avocado aioli? Made these yesterday, and your “Perfect veggie burgers”. Tasted delicious! The burgers are so far the most jummy veggie-burgers I’ve had since going vegetarian! Thank you for sharing all the lovely recepies! I look forward to try more of them. Feel so lucky to have stumbled upon your blogg! every time I’ve made this recipe it’s been a hit! I always make it as a side, but everyone says it’s their favorite part of the meal. So next time, I just might make it the main dish. These look amazing! And really quite simple. I’m having a small house party tomorrow for the Super Bowl and I’m definitely going to make these. I’m probably going to double it though. Thank you for the amazing recipe! These were amazing. So easy too. I can’t wait to make them again. I made this a week or so ago, and it was AMAZING. I ended up accidentally making a lot of avocado aioli, which was great because it kept really well in a jar for pretty much the whole week. I put it on everything! Made these tonight…not nearly enough…ate mine fast so wasn’t “able” to share with my kids. Devine. OMG, these are SOOO good! I find myself making this dish over and over again. It is delishious with the avocado ailoli but it’s also VERY good with the sauce from the “cheeszy kale chips”. I had leftover sauce last weekend so I just served it alonside the potatoes. My husband, however, inhales them without ANY sauce at all. He sais they’re so good on their own he does not want to spoil the natural taste. Well, to each his own, right? My kids and I polished these off in 5 minutes watching the SuperBowl. Thank you! Good grief, that looks incredible! Sorry if someone’s asked this previously – could I sub plain soy yoghurt for the vegan mayo, do you think? Hi dear. Thanks for the lovely recipe ^^. But I am wondering, cloves of garlic is that a bulb or just a single? There seems to be confusion even on the internet. Just consumed test batch. Verdict’s still out. I’d better make another. These potatoes are so yummy and easy to make. I made these with purple potatoes and it looked absolutely stunning with the bright green avocado aioli drizzled on. Thank you for the wonderful recipe this has been a big hit with my family! I just made these with some baby red potatoes and got about 15 out of it. I also added some smoked paprika to the aioli for a little kick. Delicious! These look absolutely amazing! I will be trying them out tomorrow at dinner :) I have always wanted to go Vegan but have found it really hard in the past – you are definitely inspiring me with these delicious recipes. I made these, and they were easy and delicious! A big hit with my husband and picky daughter! (She didn’t eat the “green stuff” but loved the potatoes!) My avocado wasn’t quite ripe enough so I had to add a tiny bit of water, but it was still excellent! Thanks for the great recipe! I can eat potatoes all the time, i love it! Thanks for shar.ng. Angela, these were AB FAB! My husband gushed over them and appreciated the fun change up on the usual side. Your cookbook arrived on my doorstep today. I’m looking forward to diving deep and getting my cook on. Thanks for your great work making beautiful and delicious vegan recipes. Those are truly amazing. So crunchy. My finance loves them especially the sause. Definitely trying this but with plantains instead of the potatoes…..YUMMY!!!! I just made this tonight for my family! I was a big hit! Every one loved it, even my sister who thought vegan food was nasty! Thanks for all your recipes! This week we are going to make your vegan tacos, and your vegan bowl! Oh and blueberry muffins and the fruit kabobs! Yum! I am definitely going to try this! Love your vegan recipes, comments, photos, and your delight in sharing them. Making your lasagna with cashew cheese for family tomorrow. My husband and I teach Healthy Lifestyle, so your recipes and site will be shared with many! Thanks, thanks, thanks. I love all your recipes, but just made this one tonight and OMG were they good!!!!! I am NOT a mayo person (veganaise or not) but my husband keeps organic mayonnaise for sandwiches, so used that. It was so delicious, I couldn’t stop eating them! Delicious recipe! I liked the results of cutting the potatoes in half and then smashing them. It was a bit thinner for the roasting process which resulted in a bit more crispiness. Thank you so much, Angela, for this amazingly yummy still super easy recepie!! This became my boyfriend’s favourite weekend meal. Thank you for inspiring us and make us eat so much healthy with your super recepies >:D<! I made these, and they were delicious! The avocado aioli I actually made without the Veganaise (because I’m a poor college student lool!) and it was delicious! The only problem I had was I boiled the potatoes for 30 min, not tender, then 45, not tender, then a little more, and I could not get them to smash?? It’s still delicious with cooked potato and the aioli but I was just wondering if there were any tips or maybe I did something wrong? Anyway, great recipe! Maybe the size of the potatoes? High altitude? And sometimes I find organic potatoes and sweet potatoes can take longer. Don’t know why! Hi there! Absolutely fantastic recipe. I loved it so much I bot your cookbook, but couldn’t find this recipe in it? Tried this recipe, spent the better part of 4 hours on it. Invested over $30.00 gathering the organic ingredients. By the time I was finished I was so starving I ordered a pepperonni pizza which was 1,000 times more tasty and only took 20 minutes to come to my door. So lesson learned I suppose. What do you suggest serving with the potatoes as an entree? They look amazing! I keep coming back to this and have yet to get on it! I must act soon on this deliciousness! What do you recomend if I don’t own a food processor? Will the sauce still be ok if I just blend the ingredients? I’m not sure as I have not tried it in a blender. My guess the sauce would be difficult to blend since there is not a lot of liquid in it. You can certainly give it a shot! Just useing fork would be fine. Crush the garlic in a garlic crusher, and mash the avocado with a fork. Them just keep mixing in the mayo and lemon juice. Shouldn’t be an issue at all, as long as the avocado is ripe. I tried to smash the potatoes however it shot across the room haha! How did you smash them? Best Potatoes I’ve ever had In My Life!!? Oh, these were lovely, and I made mine extra garlickey! Of course they weren’t as pretty as your pictures (mine had a big glob of avocado mayo on them), but goodness, they were delicious. Having them tomorrow again, as I still have a whole lot of that avo.mayo left. Maybe with some BBQ-tofu tomorrow! Wow! This is genius! Making it for dinner!!!! I am contemplating/about to begin a vegan diet. I was at first afraid because the first things that comes to mind is “I’m going to starve! Can only eat veggies, fruit, nuts, beans and grains!” But wow, I am more excited than ever now! I couldn’t go wrong with a single one for these recipes! Really excited to try this recipe tonight up at the lake! Now my only question is..what else would you serve with this? I would like to incorporate it as a part of meal rather than an appetizer or entrée. Do you have any suggestions? Can you prepare these ahead of time? Both the potatoes and the aioli? If so, what would the process be? Thank you. This looks amazing, I’m making them now! These looks awesome! Cannot wait to make them in a couple of days when my daughter comes to visit. Was looking for something a little different, I usually just roast my potatoes for my vegan daughter, I know she will love these as will I and the rest of my family. Just tried this recipe, but oh my goodness, DELICIOUS! I am not an expert cook by any means, so this recipe was perfect and easy to follow :) My boyfriend, who is probably the furthest thing you can get from a vegan, loved them too! Definitely will be making these again. The best possible way to cook potatoes, which, considering the many possibilities of cooking the humble spud, is saying something!! Couldn’t get hold of vegan mayo at short notice but added a little soya cream (not the sweetened variety) instead. Thought it would be good to mention as a few of the above posts asked about mayo replacement. Works a treat, makes the avocado alioli drizzle-able. If thats a word…. Did you receive feedback on any substitutes for veganaise? I was thinking tahini? Just made this with pork tenderloin. YUM!! This looks awesome! I need a new high rotation dish and have to try this one soon! I just have to say this recipe has become a staple at my house. We make these for breakfast to go with eggs or as a side dish for dinner. It never ever fails to please. So good, thanks for sharing! HI! I hope you get this and can respond… I am also pretty sure you’ve been asked before. Why is there no nutrition info on your recipes? Is there a calorie range? I understand the idea of eating for satiation etc, but my concern is that when one is designing a fat loss diet, certain parameters are usually established so there is less guess work as a body adapts…? I just made these and they were amazing! I used a regular “masher” to smush the potatoes and it made a lot more crunchy edges. Can anyone recommend what to have these with? These are absolutely delicious!!! I am a complete potato fiend, so I chose this as the first recipe to try off your site :) . Nowadays, these are quite possibly one of my favorite ways to eat them! I I have made them a couple of times, and they are splendid each time! SO GOOD!! Having really bad food allergies lately and was looking for something gluten free and dairy free and but free and this hit my cravings so well. Thank you thank you thank you. how long does the aioli last? Since it has avocado does it need to be used within a certain time period before it goes brown? How did you get your potatoes to be so thin? Did you cut them in half and then smash them? I smashed mine and they’re ginormous! I can’t wait to bite into them!! Just came across this and these look so yummy! I feel like you could also make these appetizer/bite sized by cutting the potato into large square chunks, boil them, then mash them with a fork and roast as usual (although you may have to cut the roasting time down), and drizzle away. Have never tried it, but was liking the idea of making these a bite-size version. I have made these twice now and they were a hit both times! I had to use off brand Miracle Whip this last time and I must say the aioli is better with the Veganaise. I served these with Korean BBQ chicken and roasted asparagus. Definitely a keeper. Can you make these ahead of time, Drive an hour to a party and heat up and serve? Or is it best to pick another recipe? Hi, I am in the process of making these right now and can’t find the temp. to bake them at? Am I blind?? please help! So delicious, thank you for the recipe!! I substituted the Veganaise with Soy Yogurt, since vegan mayo is not available where I live and it worked just fine. I almost regret not buying two avocados, b/c it is so yummy! The aioli is delicious! I made some by hand with garlic squeeze instead of processing a clove. Still tasted great! I just made it for dinner, OMG it was so delicious, the whole Family loved it! One of the best potato recipe I made so far. Thank you so much! We love these potatoes! And the aioli is outstandingly tasty! I really need to stop looking at your blog when I’m hungry- these look amazing! For all of those people out there that say you shouldn’t eat too many potatoes I say PHOOEY! I am almost 64 and have been eating them in copious amounts my entire life and this recipe is amazing!!! The only problem I found with this recipe was that the potatoes were too dry. So I added some “butter” and mashed them a little before I put them on the pan. I don’t have the heart to give them 4 stars for that because the flavor is amazing so they still get a 5 from me! Had these with dinner last night and they are amazing! So easy and taste so decadent. Im a newbie vegan and my son isn’t. He ended up eating 6 of these! Big hit and I will be making them again. Thank you! Love, love, LOVED this recipe! I served it with freshly chopped grape tomatoes and added a bit of cilatro+green onion on top for garnish. Your recipes never fail to amaze me(thinking: burrito bowl)! I just made this and it’s seriously AMAZING!! But I was wondering if the aioli will keep in the fridge for at least a day? Thanks! I made these the night of my husband’s office party and asked an early arrival guest to be my guinea pig and try one before I offered them to the rest of the guests. She approved highly, I put them out for the rest of the guests and they gobbled them up! I have made these several times since and they are always a hit. The aioli is amazing and goes well on just about anything. I’ve had this recipe on rotation for over a year now, and everyone still freaks out when I make it. Instead of the aioli, I use the avocado pesto recipe from your Powerhouse Pesto Plate (no Vegenaise or yogurt required), and the combo is taste bud amazing. Also, for anyone wondering how to drizzle on a sauce: Take a tall glass. Place a ziploc sandwich baggie in and fold the top over the outside of the glass. Fill with sauce, then pull the baggie out and squeeze out all the air. Zip it up, and cut a tiny hole in one corner and voila, you have professional drizzles! I’ve had this recipe on rotation for over a year now, and everyone still freaks out when I make it. Instead of the aioli, I use the avocado pesto recipe from your Powerhouse Pesto Plate (no Vegenaise or yogurt required), and the combo is taste bud amazing. Also, for anyone wondering how to drizzle on a sauce: Take a tall glass. Place a ziploc sandwich baggie in and fold the top over the outside of the glass. Fill with sauce, then pull the baggie out and squeeze out all the air. Zip it up, and cut a tiny hole in one corner and voila, you have professional drizzles! Also, I like to serve these on a bed of spinach with some quick roasted asparagus. Squirt the other half of the lemon on and good to go. Huge hit at my house. I used cilantro instead of parsley because, well….avocado! And I used baby potatoes from the garden…reds, yukons and blues. Magnificent! I made extra so there would be leftovers, and these little gems are great tucked inside black bean & scrambled tofu burritos. Definitely making it to my Go To list! Forgot to rate this recipe. 5-stars in my book! I have made this SO many times. I really love it! My wife and I just made these for dinner…AMAZING! Thanks for the recipe! Hi Marjorie, I find the avocado aioli is best enjoyed fresh. Unfortunately, avocado tends to spoil quickly and it doesn’t freeze well (it discolours). Sorry I couldn’t have better news! Hi Angela, I noticed that another food blog had practically an identical recipe (a couple of ingredients were added or removed). I thought you should know since I believe this person to be using your recipe and claiming it as her own. I could not find any credit given to you. Hey Jennifer, I’m sorry I don’t use a pressure cooker so can’t really comment on that, but I can tell you that they got wonderfully crispy using the boiling + baking method. :) Enjoy! I pressure cooked the potatoes first then followed directions exactly and the were perfect. The spuds are in the oven. Now. But oh my goodness that aioli! I finally broke down and bought some Veganaise…I was never a mayo eater but I wanted to try this recipe and so many others, so figured why not? SOOOOOOOOOOOOOOO glad! Only problem is the aioli might not last to make it onto the potatoes. Glad I bought extra avocados, because, avocados. And this aioli! I could use it as a spread on almost anything, which, I am sure you have already done. I saw someone else thought of cilantro instead of parsley. I have both so I was going to do a side-by-side comparison. Thanks so much for this! HOLY CATS! Angela, these are I’m-making-my-special-double-cooked-potatoes-for-the-party phenomenal! And they’re so easy to make. Whoa, so good. The aoili sounds amazing! How long will that keep? Can i freeze it!? Extremely late to comment on this post, but I just have to say that I loved this recipe! It was so easy to make and came out amazing. I could eat the aioli on a piece of cardboard it was so good, lol. Thanks for the great recipes and keep them coming Angela! “Oh She Glows does it again” These are the words out of my husbands mouth after he took his first bite. He loves it when I whip up one of your recipes. Thank you so much for making it fun to try new things in the kitchen. We have your cookbooks and when he sees it on the counter you can tell he is excited for dinner. I made these yesterday to receive my non-vegan family, everyone loved them and my husband asked me to do them again!! Perfect with the avocado aioli!! Miam! Will do again for sure! This looks so good! But I am worried about transported it for Thanksgiving dinner. Any suggestions? I may just go with plain old mashed potatoes but am open for suggestions! Easy and delicious! Especially accompanied with the advocating cream sauce. I’m new to this vegetarian thing – these look amazing. What would you serve them with, if you wanted to incorporate into a meal? I made these for lunch today. I happened to have leftover shiitake bacon and sprinkled it on top. Amazing!! I made these today and had artichokes on the side and used the remaining avocado aioli as a dip. So good. I made these last night! They are amazing! My husband loved them. Thank you for sharing! I doubled the recipe for an outrigger club party today, having never made these before. They did go lightning fast and I’m pretty sure no one knew they were vegan. Glad I got one, anyway! I used a 5 pound bag of organic red potatoes, boiling the big ones and small ones separately since I couldn’t fit the whole bag in one pot. I’m glad they were a hit, Maura! This is the latest in a string of amazing recipes I’ve made from your cookbooks. I’ve been really disappointed in other vegan cookbooks, finding the recipes lacking in flavor or having weird textures, but yours are consistently fabulous, and many have become staples in my day-to-day cooking. These were a hit at my neighbor’s fireworks viewing party this past weekend. Thanks so much for your fantastic way with vegan food! Thank YOU so much for the lovely comment, Susan! I’m grinning ear to ear. I’m so pleased to hear you’ve been enjoying my recipes so much. :) Happy cooking! hey Megan, I haven’t tried this yet, but you may be able to add a small amount of cashew cream in lieu of the mayo: http://ohsheglows.com/2016/03/13/cashew-sour-cream/ I would start small with a tablespoon, and add to taste. If you try anything out please let me know how it goes! These sound great, but I’ve never heard of soy-free Veganaise or vegan mayo. I assume both of these items are where you might buy mayo (regular kind). Is this just to save calories or does Veganaise or vegan mayo taste different? Hi Vickie, Oh good questions! It’s very similar to regular mayo only it’s egg-free. You can usually find it near the other dairy-free chilled items in the grocery store. One of the BEST dairy free mayo is called JUST MAYO….They also make salad dressing..no eggs..no dairy..NON GMO God bless em…. These are absolutely delicious…can’t say enough about these! 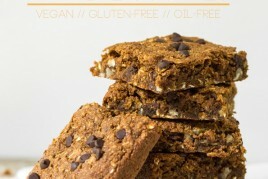 My daughter is Vegan (I am not yet), but am trying out some of your recipes …fantastic! I will definitely be trying more of your recipes! I bought your cookbook for my daughter, and she loves it! Hey Laurie, Thank you so much for your support! I’m so happy you love this recipe. It’s a fave in our house. This recipe was ridiculously tasty. Totally satisfies my cravings for potato chips. I came across this looking for something to do with my leftover potatoes. 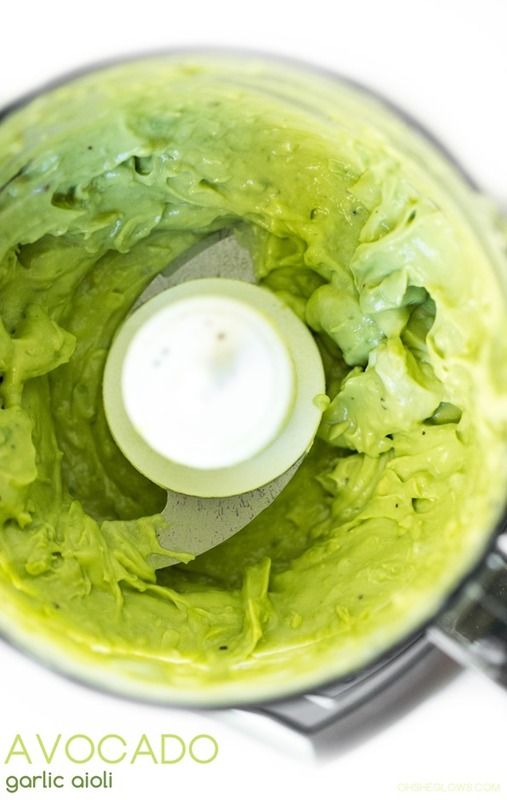 I made potato patties and topped it with this avocado aioli recipe. I added a little pickled jalapeño and a little cilantro as my potato patties had bell pepper and onion. I could have (and really had to hold myself back) eaten all of it and licked the bowl. Hey Kim, Thanks so much for trying it out! So happy it was a hit :) My hubby and I were just talking about this recipe yesterday…mmm…need to make it soon! I’ve made these before and LOVE them. I’m wondering if these will smash and roast ok if they’re refrigerated over night and are cold? Hey Stacey, Oh that’s an interesting question for sure. I’m not sure whether the chilling would impact the overall outcome. My guess is that the potatoes might be a bit firm for smashing so maybe letting them sit at room temp for a bit may help? If you try it out I’d love to hear how it goes. I love, love, love these smashed potatoes. I was looking forward to these as soon as I saw the recipe and unfortunately my kids loved them too (I was hoping to eat the lions share of them, I have to admit). Now that they’re a favorite we’re going to make them often. I might have to make a double quantity next time – the way they get gobbled up in our home! I’d definitely say that’s a win! So glad to hear they were a hit with your family, Charlie. I would love to make and bring these to an informal dinner party. Should I boil and bake the potatoes at home and them reheat there, or would that dry them out? Should I bring my mini food processor and make the sauce there, or can it hold up for a couple of hours in a fridge? Hey Donna, Aww thank you for your kind words! :) You are so sweet. To be honest I don’t know if this can be made in advance. If you try anything please let me know how it goes! These are just like Chrissy Teigens!!! Can’t wait to try these! Hey Nikki, oh I haven’t tried her version….thank you! I’d love to hear what you think if you try the recipe. When I say these crispy potatoes were absolutely delicious! Great recipe! I made this recipe exactly and I will be making it again this weekend because my fiance couldn’t get enough. 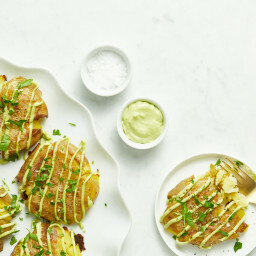 These potatoes made a great afternoon snack and the avocado garlic aioli was fantastic! Thanks for sharing such a great recipe!